By far the most manipulated word I have come across is’ patience. Here’s a fun activity to do; ask people around you of varied ages what they mean when they say ‘have patience’. You will get a mixed answers, some may make you feel pessimistic about it, some may make you feel good. You see, patience is like a shawl that all of us have had to wrap ourselves with at some point in our lives, and based on how our issues were resolved we define patience. I know that a lot of the people around me take patience to be this miracle that will cure all problems, but their way to practicing it is just sad. Patience around me mostly has been defined as to bearing with whatever is happening, basically putting up with whatever rubbish it is that is going on in your life. Now mostly our problems are due to others around us and not so much because of ourselves. So once we do whatever we can to resolve our problems, we have to be patient while others continue to be the way they are and hence continue to mess with our lives. Spiritual people will manipulate patience with no end. They will say God will reward you for your patience (as defined earlier in this para), you shall go to heaven for your patient (ditto) blah blah blah….But I was never satisfied, why would my own creator want me to just sit and suffer? So I got very interested in the topic of patience/Sabr and found much to read, and understand. Some of the stuff didn’t set with me, as humans we always try to apply every concept to our own personal lives and see if it fits, and if it doesn’t or seems like it doesn’t we totally reject the idea/concept/belief. In Islam patience is of different types, there is much reward for the one who is practicing patience etc etc. Understood. My ultimate understanding of patience was discovered in an interview of Maulana Jaun, it wasn’t even on the topic of patience BTW, but in his talk he cleared the air about it. And that is when the cloud of confusion moved away. However this cloud is one stubborn cloud and keeps coming back, and pushes us to despair. As struggles in life increase with age, I have noticed that the most difficult problems are the ones caused by others. We don’t control the universe, and anxiety can totally take over our sanity and leave us pessimistic, sad and depressed. The worst state that one can reach due to such happenings in life is despair AKA Yas. (It is the second greater sin in Islam). Basically once you reach there, it’s all downhill! Anyway, today being the first day of the month of Ramadan, I decided to listen to a lecture I had saved in my ‘watch later’ list on Youtube. Usually in life I have noticed that I go looking for something, with good intentions but I most of the time do not end up getting it, however I end up with something more. I guess it’s Gods way of guiding His people. Just like the lecture above I actually went about to know more and learn more from and about Bibi Zainab (AS) since I share her name and believe it is important for us to understand the affect of the name of the person on whom you have been named. It just so happened that Sheikh Jaffer in this lecture speaks about the various good qualities of her, but focuses the majority of his lecture on Patience, and while some of the information (like the types of patience) was already familiar to me, it was his explanation that answered some of my questions, brought peace to my heart, and most importantly gave me the inspiration to be more patient. Patience in all it’s true meaning, means to be steadfast, while waiting for the results. And so you don’t sit thinking patience is the finality of your struggle, it is what will enable you to work, struggle, move to make things better. The truth is that it’s a phase, and Islamically your patience being tested is a sign that you are chosen to be tested. As mothers and human beings, we have the responsibility of a society on us as we nurture future adult members of the society. It also the responsibility of the fathers, but I am focusing on mothers because I am one. And I firmly believe and second Maulana Jaffer in educating and supporting our children in understanding what patience is. And most importantly as parents we need to not just jabber about the theory of patience, but be brave role models. We all know that children learn through what they see, and they should see the beauty in our struggles, so that they are chosen for bigger struggles and grow closer to their creator, and also become the support system for others who are going through a difficult time. IGP is Indias largest online gifting store in India, they started their website in 2001, which also makes them the oldest and most experienced in the industry. They specialise in personalised gifts, flowers, cakes, festival merchandise among others gifting ideas. The website is clean in design, simple to browse and such that you can find a gift easily because of the various links on the home page itself. They have a simple animated video on ‘how it works‘ for anyone who is new to the website.You don’t have to browse through the whole website to find what you are looking for, they have four major categories ; ‘Personalised Gifts‘, ‘Gifts by recipient/occasion‘, ‘flowers and cakes‘ and ‘Gifts by country/city‘. Apart from these, you can also find other filtered links like ‘Gifts for anniversary’, ‘gifts for Birthdays’ etc. They keep in tune with any special days that come up in the calendar like valentines, mothers day, etc. All this helps in streamlining the search and finding the gift. I am aware of a couple more gifting sites, but haven’t dared to try them. It was very nice of IGP to approach me to try it out as a courtesy. My experience with the customer support was satisfying, I was having some issues with placing the order because of crappy internet, and wanted some information on a product as well, so I had reached out to their customer care and they were very helpful. The helpline operator, made a note of my query, gave me an estimate of when she would get back to me with the information I needed, and she stuck to it. I was very pleased with their service. When it comes to buying gifts for someone you want to make sure that everything is perfect and there should be no room for mishaps. Nothing in the world is perfect is it? Critically analysing the website makes me want them to have a larger range especially for little kids, it would be nice to purchase products that I or anyone may not otherwise find on other retail stores in India as gifts. Also, since I was placing my order around the Mothers day the website was very slow, which also I got clarified by the help-desk that it was because they were constantly working on the website by adding new products for mothers day. But still it kind of was annoying. Having said that , I will give IGP 4/5 and will definitely turn to them for future gift purchases. Especially since many of my friends and family reside in Dubai I always tend to lose out on doing something special for them, sending a bouquet of fresh flowers, or a personalised gift from here, would enable me to express my love for them. IGP delivers to over 90 countries, and over 350 cities have same day delivery option! Isn’t that impressive? Highly recommend the site, have you ever purchased anything from there? Mothers Day went by and brought a lot of joys for moms across the globe. The social media exploded with posts, photos, heart warming messages and quotes, videos and loads of competitions/giveaways. There was happiness everywhere. I am a mom too, and I pondered over my life and the many moms that I know of. Deep thoughts made me realise that we don’t discuss some mothers. We are too caught up in the normalcy of life, and the struggles we see in common around us that we do not think beyond them to realise a fellow mom exists who isn’t in the same state as us. This Mothers day I thought deeply of the moms like me, Moms who visit the courts to fight for their childs custody. I at-least have baby Abbas with me now, to feel more like a hands on mother, but what about the mothers who are struggling in our judicial system fighting in court for the best interest of their child? Dealing with an ego-centric ex-husband, not being allowed visitations! Thoughts led me to think about the moms who aren’t living the ordinary life. They don’t get a card or gift from their child, because their child passed away….Moms who are trying to make a living on their own as single parents, moms who have just separated or divorced and are trying to figure out the dynamic of their new life…moms who have child/ren with disabilities….moms who have children fighting for their life in hospitals..moms who chose to be moms and adopted children…..moms who have recently lost their moms…moms who may be battling a life threatening disease…moms who have been separated from their children due to war, moms who are unable to meet their children waiting for visitations rights….Moms who have children who have not turned out to be morally sound….Moms who are consoling daughters/sons who have been through abuse…..moms who became moms due to assault…They are all moms aren’t they? From my personal experience I have learned that; yes, in our country and culture moms are given much respect. But a lot of that is in words. “Maa” they say, but sometimes a mother can be another mothers worst enemy. I guess it’s only when you go through certain experiences do you recognise the honest people from the big-talkers. Everyone says moms are the most important person in the lives of children, yet we aren’t as aware of the severity of mommy struggles that surround us. Truly mothers are the strongest creatures on earth. I remember my moms prayers, whenever she used to hear the sound of speeding sports bikes in the late hours of the night, she used to say “May Allah give patience to the mothers of these boys”. I’m talking about school days, the thoughts that used to come to my mind were ‘oh cool, they’re going by like lightening…or I wish I could ride a bike that fast…..or why can’t be quieter….’ But since my mom voiced her concern as the mother, empathising with the moms of those biker boys I realised that there is such a solid perspective to this. How many times a day or month or even year do we think from the mothers perspective? How many of us have tried to think about the experience of the mother whenever her child goes through something? I tell myself during my mommy struggles that, at-least I have faith, and the faith in God is the best. I am grateful that I am not a refugee separated from my child, I am grateful that my child hasn’t died in a shooting at school, or been killed by terrorists or extremist groups. As a mother I think it’s important to empathise, put ourselves in the shoes of other mums, even if it’s just in our thoughts and try to understand what the other moms are going through. Only a mom can understand another mom. I request prayers from everyone for my pending custody case, hope to get my daughter back soon and give her the life she deserves. I am not a foodie, but when I step out of the house and have planned to eat somewhere the food better be good. As a mother who is the cook of the house I take my meals outside very seriously. It is my opportunity to eat something I haven’t sweat myself into cooking, which is also why I try new cuisines whenever possible or at-least something different. Bean Fritters- They were crispy and filled with beans and cheese, just yummy. Nachos Rancheros with chicken- in every bite the black beans just gave a burst of flavour I have never tasted before. The crispy tortilla chips and the cheese with the pica de gallo topped with the chefs custom made sour cream is just wow. It is a must try appetizer. I must say, for an appetizer it was pretty filling even though me and the husband shared it. La Burrito-half of the burrito was taken home for two reasons, one; we couldn’t just manage to eat it all, and two; we had to have people at home taste it. It is my sincere advice to order a take away for family while you’re there. The burrito is basically a large flour tortilla wrap which contains the black beans, salsa, rice, Mexican cheese and chipotle ranch dressing. Ours was with chicken, there’s vegetarian option for all their dishes. 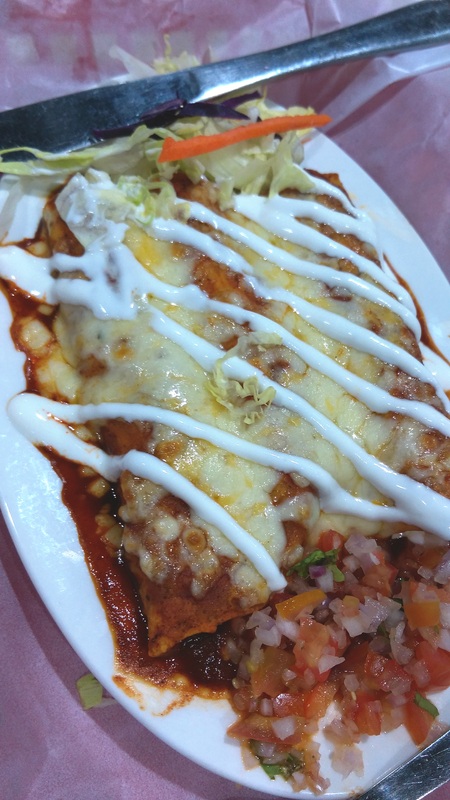 Quesadillas- This has to be my favourite dish served at La Mexicana (Although I haven’t tasted the whole menu). The flour tortilla is grilled and gives a slight crispiness and the grilled peppers give it a rustic flavour even though they retain their juiciness. The next two were tried with a purpose, I could not have left without exploring their salad. It looked super appetizing in the pics on their facebook page. hence the Southwest Chipotle Salad was dug into. It is difficult to find salads that don’t make you feel like you’re missing out on flavour and good ingredients, this was obviously with chicken. And I loved every bite of it, till the end I could taste every ingredient, all of them were in balance. It was a good filling portion as well. The crispy Tortilla chips took the salad to another level! Enchiladas I was told the chilli in these were imported from Mexico, how could I deny not tasting then? I am not a chilli person but this dish wasn’t going to kill you. I have eaten some really dangerous food in Hyderabad when it comes to red chilli involvement. It was served with a generous portion rice and black beans. 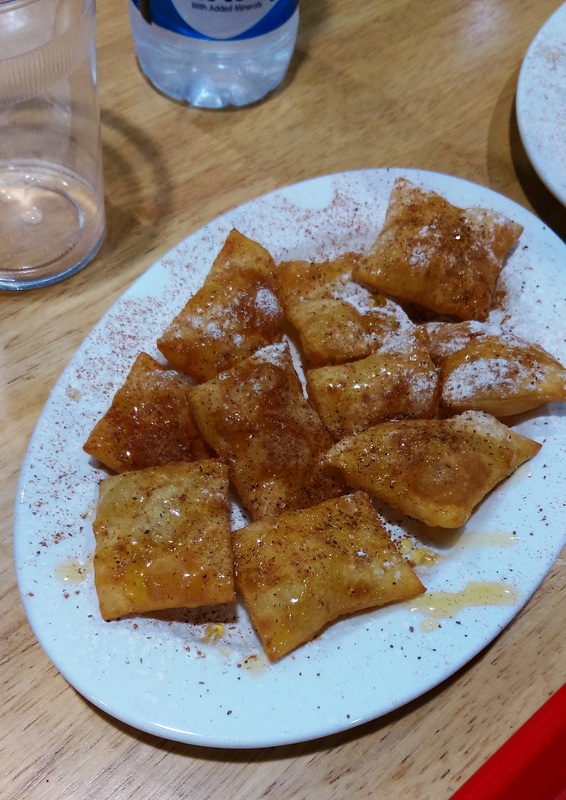 And for dessert the Sopapilla, I loved it because it was the ideal dessert after eating all that food. It was light and sweet but not too sweet, the cinnamon powder and icing sugar gave it a melting texture in the mouth. This dessert should definitely be eaten fresh at the restaurant. They have an open kitchen and the ambience is creative, there’s plenty Mexican inspired decoration on the walls, even some humor. It kind of transfers you into another place. This is the only quick service Mexican restaurant in Hyderabad and they’re good at what they do. The only problem is that it’s super far. I have been told that they are going to open up more branches in the city, hoping for one in Banjara Hills area (Fingers crossed). Totally recommend it, they have a kids menu as well, so if you’re a mom like me, take your kids to La Mexicana and have them experience a different cuisine as well. The good thing is even though it’s fast food, it’s healthy. They make their dishes from fresh ingredients and everything is made to order. Everything I have eaten was just bang on, I am looking forward to tasting their guacamole, they make it only when the avocados are in season, I respect that about La Mexicana, they definitely are focused on providing fresh ingredients to their customers, otherwise frozen avocados could very well be used like other restaurants.